Winter - the most suitable time for soups, warm and fragrant, lean on the other hand, the richness, and, of course, soups, mashed potatoes. One of my favorites - soup of lentils. Why lentil? First of all the legumes, it is the leader in nutritional and beneficial properties. Just 200 product contains grams daily intake of iron and folic acid. Secondly, taste lentils, incredibly flavorful with subtle oriental notes, as for me, can not be compared with anything. Third, lentils is rich in vegetable protein, which is easily absorbed by the body, carbohydrates in the product - complex (glycemic index - from the 25 40 to, depending on the variety). Врачи рекомендуют употреблять чечевицу при сахарном диабете, язве желудка и двенадцатиперстной кишки, колитах, при нарушениях обмена веществ. Также чечевица способствует укреплению общего иммунитета и нормальной работе пищеварительной системы. О полезных свойствах данного продукта можно говорить много, я же предлагаю поскорее приготовить этот чудо-суп, не откладывая в долгий ящик. Lentils are known, can be of different types: green, yellow, red, black, brown. Feel free to use the one you can buy in your store, without a doubt, all kinds of very useful and tasty! greens (any) and pumpkin seeds for decoration. If you want to cook the soup in meat broth, then add to the listed ingredients 500 grams of chicken. Lentils, rinse, put the stew in 2 liters of water. There also, in cold water, chop carrots (on average round or square slices to quickly welded), onions, put a bay leaf. After all boils, remove the foam, if necessary, and cook about 40 minutes. Yes, do not forget to add salt! Readiness can be determined by trying lentils (it should seethe), slightly turbid water. Carrots should be soft. If you cook chicken and then for this time, it should also boil. Drain most of the water in a separate container (not pour - we still need it), remove the bay leaves (and do not forget to remove the chicken, it must be cut into small pieces, and then add in the ready-made soup). Blender chop all the contents to homogeneity (minutes 3-5), adding broth in small portions. With regard to consistency, it should be the average (not too thin and not too thick), although, of course, is entirely a matter of your preference. You can make the soup thicker, and he will serve you both the first and second courses. In the finished soup add turmeric (it will give a nice yellowish tint), pepper, coriander. Put on the stove and bring to a boil (literally 1 minute). Done! 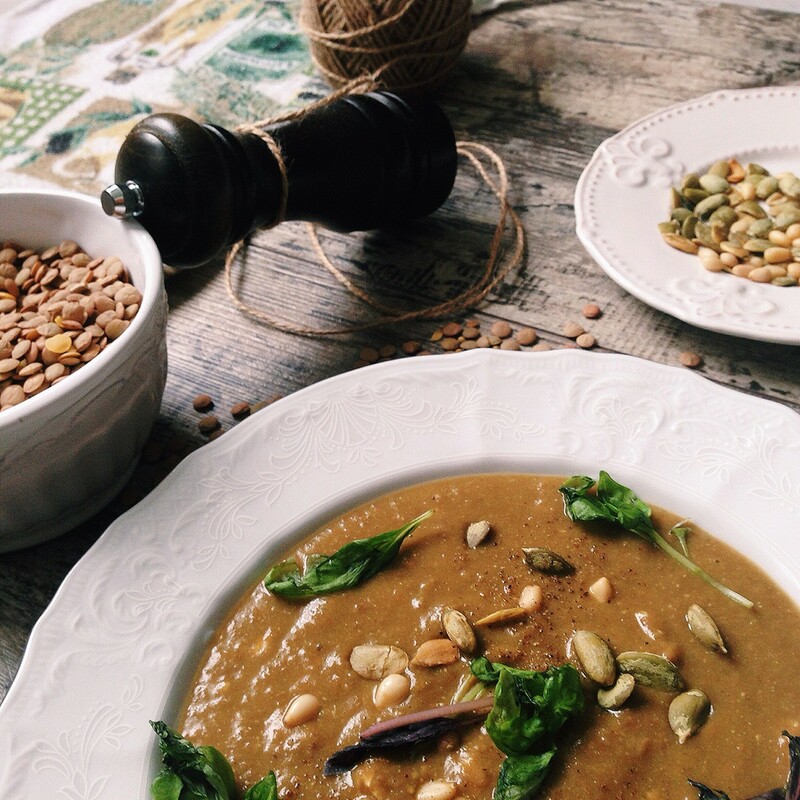 Serve the soup can be garnished with your favorite herbs or pumpkin seeds. And the children, I recommend that add a little low-fat cream soup - so the taste will be a gentle, enveloping. Soup fully meets the requirements of nutrition, rich in vegetable protein and complex carbohydrates (I deliberately did not add in the potatoes, that remained soup diet - excess starch to anything), easily digestible and rich in vitamins and minerals. Also soup of lentils shows diabetics (soup GI - 44), athletes, children! And what it is fragrant ... try soon, I promise you fall in love with it immediately!